Phoenix Lake, Dortmund’s coolest new quarter, was once an abanonded steel mill surrounded by polluted waterways and brownfields. The world is urbanising at a pace never before seen in human history. By 2050, 66% of the world is projected to live in cities. In the developing world, this rapid explosion in urban populations has strained the absorption capacity of cities and led to shortfalls in housing, transport, plumbing and other services. Europe’s cities face a somewhat different problem. The continent urbanised and industrialised centuries ago. Today, major urban centres that grew up on manufacturing must reinvent themselves for the 21st-century economy. Given the large scale of modern urban areas, which are more borderless metropolitan regions than self-contained cities, designing these Europolises of the future necessarily involves numerous states, cities, towns – and, ideally, the millions of citizens that live in them. How can so many people and institutions work together to rethink their region both spatially, in terms of its physical layout, and culturally, in terms of its new identity? The view of Europe at night clearly reveals the regionalisation of cities, which have become more a network of centres than a single urban core. Among several useful European redevelopment experiences, that of Germany’s formerly industrial Ruhr region, which began its reinvention in 2011, stands out. With its 53 cities and municipalities, and five million residents, the region is one of Europe’s five largest population centres. Once upon a time, it was one of the top heavy industrial areas in the world, producing steel, coal and iron. The Ruhr is no classic metropolis. It is comprised of numerous loosely connected cities, towns and neighbourhoods interwoven with a variety of open spaces, including dormant steel factories, landscapes decimated by coal mining, rivers and brownfields. In urban planning terms, this is what’s called a polycentric urban region without a dominant core city. The Ruhr is also demographically diverse, with communities at different stages of development and income levels in close proximity, and infrastructure mostly dating from its industrial days. Germany is determined to bring this post-industrial region into the modern global economy. And it wants to do so in a way that takes both climate change and citizens’ radically wide-ranging needs into account: urbanism on different levels and at different speeds. These are the challenges facing the Ruhr Regional Planning Association (Regionalverband Ruhr, or RVR) in designing a new regional plan that will soon become the shared development guidelines for all of the region’s 53 municipalities, including 11 independent cities and four counties, in the coming decades. The plan will replace parts of three existing regional plans where they overlap with the RVR’s area. But rather than go to battle with residents and the dozens of local powers that be (from mayors and governors to businesses), the planning authority has decided on an innovative process based on consensus-building. All municipalities, local universities and citizens have fed into the plan to turn this former industrial centre into a modern conurbation. The project is also designed to account for the region’s changing demographics, as long-term residents once employed in its factories and mills are replaced by university students, young professionals and immigrants. Little by little, section by section and with ever-changing working groups collaborating on each development project, the new Ruhr is coming together. For the recently completed Phoenix Lake redevelopment in the city of Dortmund, a developer teamed up with the regional planning association and citizens to convert a polluted former mill area into Dortmund’s newest urban quarter. 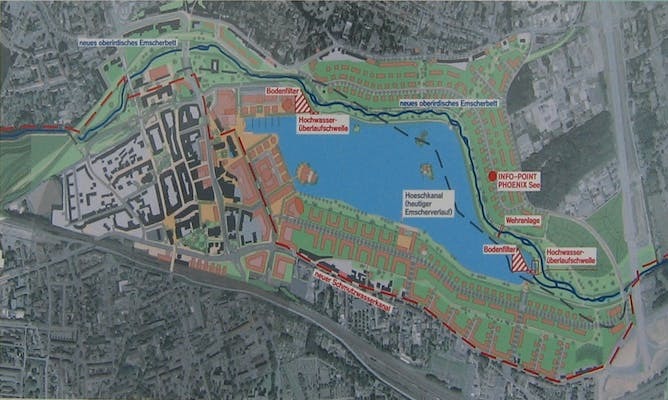 The Phoenix Lake master plan as projected in 2006. An abandoned factory was replaced with a 24-square-hectare artificial lake designed for swimming and water skiing, and polluted tributaries were scrubbed. New housing went up, built in an architectural style that simultaneously fits in with the modern landscape and recalls the region’s past as a steel centre. The Phoenix Lake project is an example of two-scale urbanism: the successful convergence of high-quality small projects with a broad and long-term regional vision. In employing this participatory strategy, the Ruhr region is closing the gap between disciplines: everything from urban theory and environmental studies to economics has been fed into its development plan. It also demonstrates that communities can work on different levels at the same time, transferring knowledge from the neighbourhood level up to the regional level and implementing regional infrastructure in individual cities. Because of this discursive style, the Ruhr’s final redevelopment document could deliver answers to the challenges facing many cities and regions around the world, from rapidly expanding Accra and shrinking, struggling Detroit to cities that, like Vancouver, are seeking to become “green”. Like Germany’s Ruhr region, Detroit is struggling to reinvent itself after the decline of the manufacturing economy that built it. Often, what we perceive as dualisms – growing developing-world metropolis versus shrinking manufacturing hub, or booming metropolis versus controlled-growth smart city – are not so different. Rather, they reveal spatial contradictions within the urban transformation processes that all cities are likely to experience at various points in their history. Listen here: Christa Reicher on Detroit and what the Ruhr can learn from it. In many global cities, for example, two seemingly contradictory shifts are currently underway: reurbanisation and regionalisation. City centres are booming as young professionals and older generations, who may have left the city to raise their children, are rediscovering urban life, in no small part because people prefer not to spend hours commuting from suburb to downtown and back every day. At the same time, cities are regionalising. The urban sphere is expanding into surrounding areas, and new multi-functional locations outside of traditional cores are arising. With the new “aerotropolis” model of economic development“, for example, we see mega airports, often located between two cities, offering not just hotels but also conference, meeting and even living spaces. Such "airport cities” are planned or completed near Amsterdam, Dubai, Paris, Hong Kong, Shanghai, Beijing, Memphis and elsewhere, according to the 2011 book Aeorotropolis. As long as the reurbanisation and regionalisation trends continue apace, the world will see ever more regional conurbations that, like the Ruhr region, have numerous, interconnected “centres”. This is the geography on display in the sprawling metropolitan region of São Paulo, Brazil, with its 39 municipalities and combined population of 21.5 million, and in the New York tri-state area (population 20.2 million), which encompasses large swathes of New Jersey and Connecticut. With dense settlement as far as the eye can see and numerous ‘centres’, Sao Paulo is a classic example of modern connurbation. As the Ruhr’s experience has shown, it is no simple thing to respond to these different trends at all the scales present in the region, but it is possible. The local must be connected to the regional at different points – urbanism on two scales, progressing at two different speeds. To design change in the interest of most citizens – and with visible achievements on all levels – is the core challenge in the Ruhr, and beyond.